Over the years, San Quentin Prison has had a good number of escapes, some successful and some not. Inmates have climbed walls, dug tunnels, cut through fences and in one incident, two inmates made a makeshift raft and escaped, paddling past a gun tower waving at the guard as they went by. When the guard noticed that they were sinking, he asked it they needed help and they respectfully declined, getting away, but getting caught later. Of all the escapes that have happened at San Quentin, there is one that ranks as one of the boldest and bizarre escapes on record, and one of the deadliest. In order to look at the story of the Great Escape, we have to travel back in history to 1935, a time when San Quentin did not always have complete control of its inmate population. Our story starts with four convicts who were serving time in the institution for serious violations. The inmates were Joe Kristy, in for kidnapping, Rudolph Straight, a bank robber, who had made two prior escape attempts while behind bars, Fred Landers, serving time for attempted murder and Alex MacKay, doing time for robbery. These prisoners were young men who were violent criminals and who had no intention of serving out their long prison sentences. In January of 1935, the men decided it was time to depart, but in order to successfully get out of the “Big House” they decided that they would need guns. But how do you get firearms into a prison? Enter one Clyde Stevens, a serial bank robber who committed robberies all over San Francisco and who was finally arrested for burglary and sent to San Quentin. Stevens was sentenced to a term of five to twenty years; however, the parole board authorized his release after only serving three years, five months, which caused an uproar with the citizens of San Francisco. The second photo shows (left to right) convicts Alex McKay, Joe Kristy and Fred Launders eating lunch during a break in their trial. Landers plead guilty during the trial and the other two were tried under the Lindberg law as they kidnapped a prison guard. During his time in prison, Stevens became friends with our four inmates and after he was released, he promised to help the four convicts escape. However, Stevens got a little busy after his release by robbing a bank at California and Polk Street in San Francisco. During this robbery, he disarmed a police officer and escaped a police dragnet. Stevens continued to rob banks in the Bay Area, which got the City of San Francisco so fed up with his antics, the city declared him, “Public Enemy Number One.” Stevens remained at large as attempts to find him were unsuccessful. Back at the prison, our four young men awaited instructions from Stevens and on January 16, 1935, the order came. Stevens, who knew the workings of the prison, was aware that there was a car that was parked outside the prison walls every night and then driven into the prison each morning. Stevens managed to hide four .45 caliber semi-automatic handguns in the car. On January 16, 1935, the car was driven inside the prison grounds as usual. Rudolph Straight, the leader of the group, got to the car and he removed the guns and hid them in a keg of nails. He then put the keg in a work truck. All four convicts got into the truck and they drove up to the warden’s residence. On that day, Warden James Holohan was hosting a lunch in his residence for several members of the parole board. Present were board members Mark Noon, Frank Sykes, Joseph Stephens and Warren Atherton. Several trustees and a few prison guards were also around the house and no one thought much of it when a work truck with four convicts pulled up to the house. The four men exited the truck and entered the house walking into the room where lunch was being served. Warden Holohan and the four board members were startled after hearing convict Rudolph Straight yell, “Stick em up!” Parole Board member Joseph Stephens immediately stood up and Straight walked up to him, stuck his .45 into Stephens’ stomach and pulled the trigger. Stephens, who later commented that he knew he was going to die, was shocked when the only noise the gun made was a click, indicating a misfire. At that point Warden Holohan attacked Straight and the two of them got into a death like fight for the weapon. The rest of the convicts watched, holding the other people in the room at gunpoint. Holohan, who was a big strong man, got the gun from Straight for a short time, but Straight got it back and struck Holohan over the head with the weapon so many times that one of the convicts had to stop Straight’s savage attack. Holohan suffered several skull fractures, but he survived. The convicts then took the four parole board members out of the house and walked them to the warden’s car. As they exited the house, they also kidnapped guards C. L. Doose and Harry Jones. The convicts ordered the guards to tell the main guard tower to let the car through the gates and no one would get hurt. The four convicts and the four prison board members and one of the guards then piled into the car. The other prison guard was left behind and Warden Holohan was left unconscious on the floor of his house. The car headed out the west gate and into San Rafael. They then drove onto the highway and proceeded north to Ignacio. Meanwhile the prison had put out the alarm and San Rafael Police Chief Sabin Kane gathered his men and they immediately started looking for the warden’s vehicle, along with many other police officers from many different jurisdictions. The U.S. Army was even contacted, and they launched a plane to assist. As the warden’s car got to Ignacio, they turned east on Highway 37, but when they got to the Petaluma River, they saw that officials had raised the draw bridge, so they turned around and headed back to Highway 101. When they reached the highway, Noon and the remaining guard were released to a group of law enforcement officers. The convicts told the officers not to fire or they would kill the remaining hostages. Completely frustrated, the officers watched as the car left, headed to Petaluma and then out to west Marin. While this chaos was going on, a telephone rang in a small justice court that was in session in the West Marin town of Tomales. Present were Marin County Undersheriff Ed Blum, Marin County District Attorney Al Bagshaw and Constable John Bones. Word came to the court advising them of the escape and that the warden’s car might be headed in their direction. Court was abruptly adjourned and Blum, with his sidearm, Bagshaw, with his sawed-off shotgun and Constable Bones, who had a high-powered rifle, jumped in a car and drove to the edge of Tomales to protect the town should the convicts appear. As news spread, the citizens of Tomales armed themselves and waited in town. A short time later, the three lawmen saw the warden’s car heading straight for them. As the warden’s car approached, the convicts opened fire on the three. Bagshaw yelled at Constable Bones to shoot out a tire to the car with his rifle. Bones, who was considered, “One of the old time real western police officers who you read about” stood undaunted in the middle of the road and fired his rifle, striking a rear tire to the getaway car. The car swerved crazily, but continued past them, guns blazing. At that moment, a car being driven by Sonoma County Undersheriff Mike Flohr appeared on scene as part of the Sonoma County posse that had been put together. Flohr, who had a faster car, had the Marin lawmen get in his vehicle and they immediately started to pursue the getaway vehicle. What happened next was arguably the most intense and violent running gun battle between two cars in Marin law enforcement history. District Attorney Bagshaw later commented that they could have overtaken the suspect car because it had a flat tire, however they elected to hang back until the car gave out. All the while, the occupants of both cars continued to exchange gunfire. When the cars got to the Valley Ford Condensing Plant, Bagshaw got his wish. As the warden’s car rounded a curve, the four convicts jumped out, leaving the car in motion with the hostages still inside. The car rolled forward until it struck a shed. Meanwhile, the convicts, who had changed clothes with their captives, all ran into the nearby condensing plant. Once inside, the convicts continued shooting at the four law enforcement officers. The first photo shows (left to right) Marin Undersheriff Ed Blum, examining one of the convict’s guns, Parole Board member Warren Atherton, who had been forced to change clothes with one of the convicts, Marin County District Attorney Al Bagshaw, holding the sawed-off shotgun he used to slay convict Rudolph Straight, and finally Constable John Bones, holding the rifle he used to shoot out the tire to the getaway car. Note the bullet holes in the back of the warden’s vehicle. District Attorney Bagshaw and Marin Undersheriff Ed Blum ran around to the rear of the building in the event the convicts attempted to run out the back. As they got in place, Blum urgently shouted to Bagshaw, “There’s one behind you!” Bagshaw wheeled around just in time to see convict Rudolph Straight raise his .45, but Bagshaw was quicker. With a squeeze of the trigger of his sawed-off shotgun, Bagshaw fired, delivering a fatal hit to Straight’s head. The three remaining convicts gave up in short order and they were transported back to San Quentin where they were put in the dungeon. Other officers began arriving on the scene and they checked the bullet riddled warden’s car to see if anyone was injured. Upon contacting the hostages, they found that Parole Board members Frank Sykes and Joseph Stephens had both been shot by what was believed to be police bullets. Stephens received a flesh wound; however, Sykes was hit in the upper thigh, which could have had deadly results, save for the fact that the slug struck a dime and a church medallion of St. Anthony that Sykes had in his pocket. The two pieces of medal deflected the bullet causing it to lodge in the fleshy part of his leg. Both men were treated at Petaluma Hospital and later released. 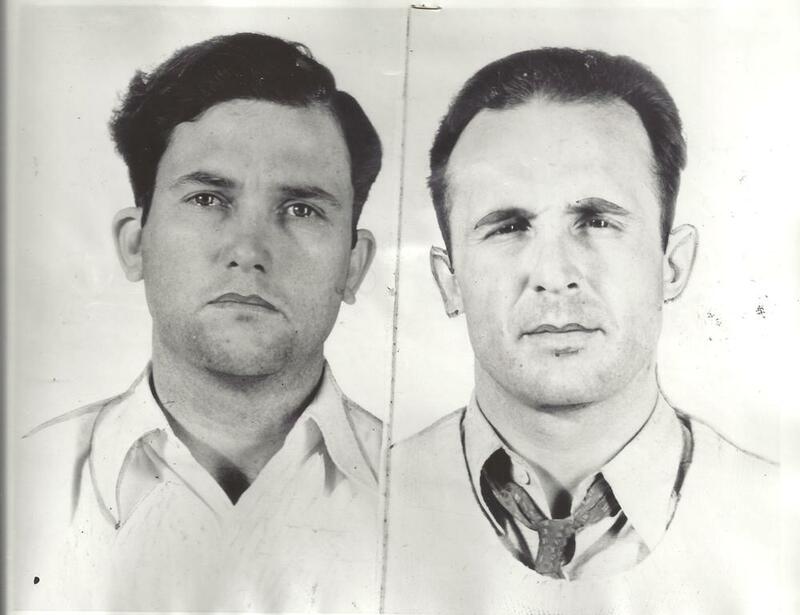 With the three prisoners back in custody, law officers knew they had one final piece of the puzzle that had to be put in place, and that was to locate Public Enemy Number One, Clyde Stevens and bring him to justice for supplying the guns used in the escape. The three convicts were interrogated to see what they knew. It is not known what interrogation techniques were used, or what was said, but after a while, officers got what they wanted. In the early morning hours of January 17, 1935, San Francisco Police Detective Captain Charles Dullea, lead a posse of handpicked San Francisco Police detectives to Contra Costa County where they met with Contra Costa County Sheriff John Miller and his deputies. Acting on a tip, presumably from one of the convicts, the small army of law enforcement officers drove and then walked through the lonely marshlands of the Delta to a small shack at a place called Johnson’s Point near Antioch. As the officers closed in on the shack, three men emerged, who were later identified as Albert Kesel, Eugene Marchin and Stewart Leese, all associates of Clyde Stevens. But our story does not end here. In a bizarre twist of events, Marin County District Attorney Albert Bagshaw, who helped hunt down the convicts, and who shot and killed convict Rudolph Straight, announced that he was going to personally prosecute the case against the three surviving escapees. The three men were tried and convicted and under California law they faced the hangman. In one final ironic postscript, it should be noted that the kidnapped members of the parole board were the ones who had approved the early release of Clyde Stephens after his last bank robbery prison term. Posted on August 30, 2018 by Evan Barbier. It was Thursday, April 26th 1934 and it was just another routine day of patrol for the San Rafael Police Department. But by the time this day ended, it turned out to be anything but routine. SRPD officers Phil Le Cornec and A. W. Dewey doubled upin a patrol car with Dewey driving and they started their patrol of the city on day shift. While slowly patrolling by the railroad yards (south of Second Street at the bottom of Lincoln Avenue) at about 2:30 PM in the afternoon, two men suddenly jumped out from behind some bushes and they ran up to the police car. Both men had guns and they pointed their weapons at the officers. Le Cornec reached for his rifle that he carried on the front floorboard and Dewey went for his shoulder holster to get his revolver, but alas, it was too late as the two men disarmed the officers. Le Cornec and Dewey must have wondered who these men were as they had received no information about any dangerous men in town. As it turned out the two were Wanda Stewart and Walter Wyeth, both males who were serving time in San Quentin State Prison. Earlier in the day they had been on a work detail outside the prison walls when they overpowered their guard and took off. They were also able to obtain two handguns that someone had hidden for them. Their plan was to take over the next car that drove by the railroad yard and as luck would have it, it was a San Rafael Police Car. They ordered Dewey to drive to Lake Tahoe but as they neared their destination they changed course and drove south through the Mojave Desert to San Bernardino. Meanwhile word of the escape finally got out at about the same time that it was discovered that the officers were missing. Was there link between the two? A massive search was conducted for the officers, but they had disappeared into thin air. Finally, after arriving on the outskirts of San Bernardino, Stewart and Wyeth released the officers and proceeded to rob a nearby pharmacy. Their take was $35 in cash, some soap and a razor. As they drove off, a Victorville Deputy Sheriff spotted the car as the officers had now been missing for 30 hours and word had been put out all over the state. The Deputy went after them, but Stewart and Wyeth had no intention of giving up. A major gun battle ensued which resulted in the Deputy shooting and killing both of the desperados. In addition, the San Rafael Police car was all shot up. After repairing the car, (which included cleaning the inside) Le Cornec and Dewey returned to San Rafael on the following Monday, safe and sound. SRPD Chief Sabin Kane interviewed both officers and after he completed his investigation, he promptly fired both of them for failing to overpower the suspects and to allow themselves to be kidnapped in the first place. This created an uproar in the city and it was discussed at several City Council meetings. After all, both officers were safe and both convicts were dead. Finally after many weeks both officers were reinstated and put back on the force. Dewey worked into the mid 1940's and left the department. Phil Le Cornec stayed with the department but suffered an unexpected heart attack on April 20, 1953 and died while still employed by the department. Attached are two photos. 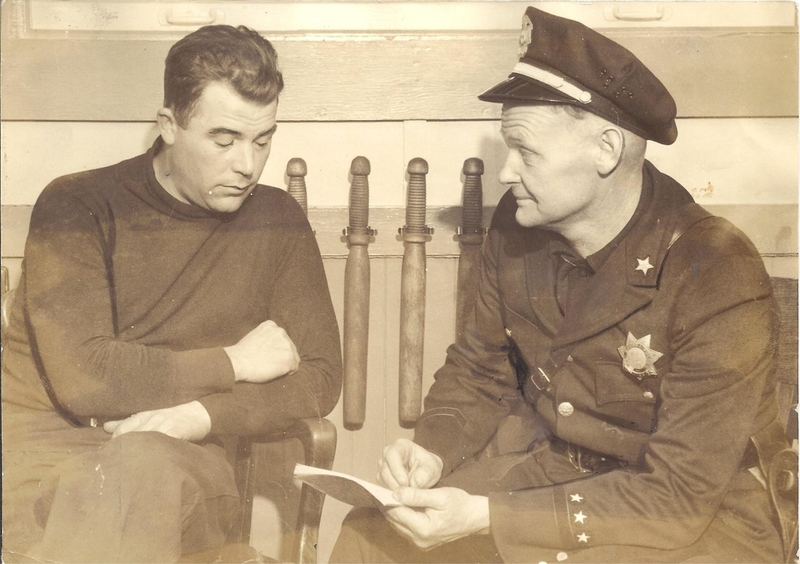 One is of SRPD Chief Sabin Cain interviewing Officer A. W. Dewey about his kidnap ordeal and the other is a mugshot of convicts Wanda Stewart (convicted of robbery) and Walter Wyeth (convicted of forgery) which were taken when they first entered San Quentin Prison. What is the worst traffic accident that has happened in Marin County in terms of fatalities? In order to find that answer we need to go back to a Saturday evening on October 3rd, 1964 where six people died in a fiery crash on Highway 101 on the San Rafael Viaduct. On that evening a male driving solo in a sports car was traveling northbound on Highway 101 at a very high rate of speed. After passing the San Rafael flats, he entered the San Rafael Viaduct with witnesses reporting that he was traveling at 90 to 100 miles per hour. As the Viaduct curved to the right, the driver lost control of his car and he crossed the center divider, which was over Third Street, and he struck a vehicle head on traveling in the southbound lane that contained a family of five. The Viaduct, which was built in 1941 (prior to that Lincoln Avenue was Highway 101) had two lanes going in each direction with a concrete center divider. However the divider was only about 4 inches tall and about 18 inches wide. Nothing else separated the northbound and southbound lanes of traffic at that time. When the cars hit, they both exploded into flames. SRPD Officer Carl Selby was one of the first officers to arrive at the scene and a short time later he reported over his radio that there were six fatalities. The Viaduct was shut down for several hours and traffic was diverted to the city streets, which caused gridlock. It was also decided that the bodies could not be removed from the cars at the scene because of the fire and the severe vehicle damage. Both cars were towed, with the victims inside, to Duffy Brothers Garage located at Third and C Street. The victims were then removed from the wreckage inthe tow yard, which was witnessed by a crowd of several hundred people who had heard about the crash and had gathered to watch what was going on. No other vehicle accident in Marin County history has exceeded the number of lives that were taken in this accident. Years later a better center divider was installed to prevent head on accidents. A new southbound Viaduct was built much later which is now next to the original Viaduct that still handles northbound traffic. The next time you drive northbound up the Viaduct and start your sweeping turn to the right take a moment to think about the five innocent lives that were lost that October night because of the actions of one reckless driver. Attached is a photo taken the next day of the vehicle that contained the five victims as it sat at the storage lot at Duffy Brothers Garage. A second photo is attached which is a day photo of a similar head on collision that happened on October 8, 1964, just five days after the fatal crash. In this photo you can see the almost non-existent center divider with a CHP motorcycle parked on top of it. Charles J. Chiesa served as San Rafael's Police Chief from 1959 to 1969. His main legacy is that he was the last elected San Rafael Police Chief. But there was one other thing that stood out during Chiesa's tenure and that was Pay Day Meetings. Chief Chiesa felt that it was important to get the entire Department together once a month so everyone could hear first hand what was new in the Department. Chiesa chose the first payday of the month to have these meetings and they were held in the Department briefing room, which is still used for that purpose today. The meeting was mandatory and it didn't matter when you worked last or what excuses you had, you just needed to show up. You might be thinking that this was very expensive to do considering all the overtime that would have to be paid to get everyone to these meetings, but think again. In those days you were ordered to show up and you didn't get paid. These meetings were run by Chiesa's second in command, Capt. Joseph J. Brusatori. Capt. Brusatori addressed the employees, going over the current business of the day and also reading the, "Good Boy" letters, which came in from citizens. After each one one was read, there would sometimes be groans from the group with comments like, "Stop getting your mother to write all those letters." Chief Chiesa would then address the group with anything important he had and being an elected Police Chief, you can bet he had a lot of important things to say. Chief Chiesa was also insistent that all of his officers be well trained in the use of firearms and officers had to qualify at the pistol range once a month. The range was open Monday through Friday for half a day with a range master present. The last order of business at these meetings was the reading of the, "List of Shame." These were officers who for whatever reason, never made it to the range to qualify for the month. Chief Chiesa's policy regarding this matter was simple, "No shoot, No pay." So at the end of the meeting, delinquent officers rushed to the range to qualify and then rushed back to the police department to pick up their paychecks. Needless to say, the first payday of the month turned out to be a very busy day at the pistol range. Pay Day meetings ended with the retirement of Chief Chiesa. Attached are two photographs. The first photo is of Chief Chiesa and Capt. Brusatori. The photo was taken in May of 1962 at the annual Traffic Boy's Picnic at Albert Park. The second photo is of a San Rafael Police Officer qualifying at the old San Rafael Pistol Range which was located in the area of Windward Way and Kerner Blvd. 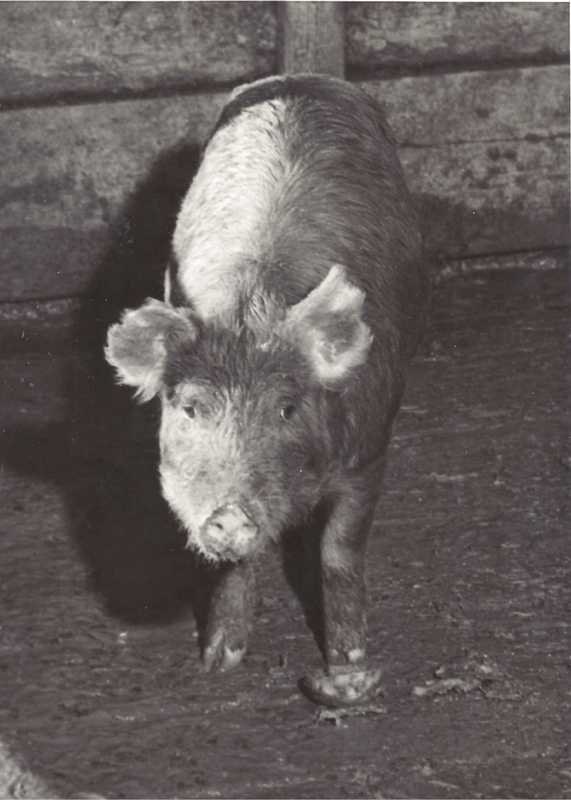 The photo was taken in February of 1966. Posted on July 14, 2014 by Evan Barbier.